Back by popular demand, The Book of Mormon, which played a record-breaking, two-week run in 2016, returns to Columbus for a limited engagement May 22-27 at the Ohio Theatre. Tickets start at $34 and are on sale now. They can be purchased at the CAPA Ticket Center (39 E. State St.), all Ticketmaster outlets, and online at www.ticketmaster.com. To purchase by phone, please call (614) 469-0939 or (800) 745-3000. Orders for groups of 20 or more may be placed by calling (614) 719-6900. 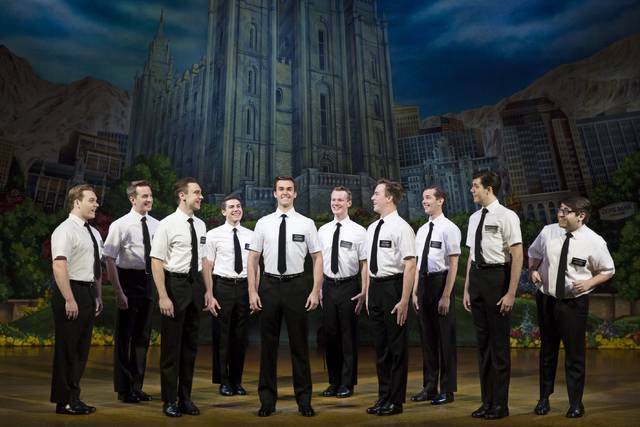 The Book of Mormon features book, music, and lyrics by Trey Parker, Robert Lopez, and Matt Stone. Tony Award-winner Lopez is co-creator of the long-running hit musical comedy, Avenue Q. The musical is choreographed by Tony Award-winner Casey Nicholaw (Monty Python’s Spamalot, The Drowsy Chaperone) and is directed by Nicholaw and Parker. The Book of Mormon is the winner of nine Tony Awards, including Best Musical, Best Score (Trey Parker, Robert Lopez, Matt Stone), Best Book (Trey Parker, Robert Lopez, Matt Stone), Best Direction (Casey Nicholaw, Trey Parker), Best Featured Actress (Nikki M. James), Best Scenic Design (Scott Pask), Best Lighting Design (Brian MacDevitt), Best Sound Design (Brian Ronan), and Best Orchestrations (Larry Hochman, Stephen Oremus); the New York Drama Critics Circle Award for Best Musical; five Drama Desk Awards including Best Musical, the 2011 Grammy Award for Best Musical Theater Album; four Outer Critics Circle Awards, including Best Musical; and the Drama League Award for Best Musical. The Book of Mormon features set design by Scott Pask, costume design by Ann Roth, lighting design by Brian MacDevitt, and sound design by Brian Ronan. Orchestrations are by Larry Hochman and Stephen Oremus. Music direction and vocal arrangements are by Stephen Oremus. The Ohio Arts Council helped fund CAPA’s 2017-18 season with state tax dollars to encourage economic growth, education excellence, and cultural enrichment for all Ohioans. CAPA also appreciates the generous support of The National Endowment for the Arts, the Martha G. Staub and Willis H. Liggett Funds of The Columbus Foundation, and the Greater Columbus Arts Council. BROADWAY ACROSS AMERICA is part of The John Gore Organization family of companies, which includes Broadway.com and The Broadway Channel. Led by nine-time Tony-winning producer John Gore (Owner & CEO), BAA is the foremost presenter of first-class touring productions in North America, operating in 41 markets with over 270,000 subscribers. Current and past productions include Beautiful, Cats, Chicago, Dear Evan Hansen, Fiddler on the Roof, Finding Neverland, Million Dollar Quartet, Hairspray, On Your Feet!, School of Rock, and The Producers. Broadway.com is the premier theatre website for news, exclusive content, and ticket sales. For more information, please visit BroadwayAcrossAmerica.com and Broadway.com. The Columbus Symphony presents The Beach Boys at the Ohio Theatre (39 E. State St.) on Saturday, May 12, at 8pm. Tickets are $48-$78 and can be purchased at the CAPA Ticket Center (39 E. State St.), all Ticketmaster outlets, and www.ticketmaster.com. To purchase tickets by phone, please call (614) 469-0939 or (800) 745-3000. The 2017-18 Pops Series is made possible through the generous support of season sponsor American Electric Power. The Beach Boys are led by Mike Love and Bruce Johnston, who along with Jeffrey Foskett, Brian Eichenburger, Tim Bonhomme, John Cowsill, and Scott Totten continue the legacy of the iconic American band. Grammy-winning songwriter Bruce Johnston joined The Beach Boys in 1965, replacing Glenn Campbell, who filled-in for Brian Wilson on vocals/bass when he retired from touring. Highly regarded in his field, Johnston’s vocal work with such legendary artists as Elton John and Pink Floyd firmly established him among rock’s elite artists. Captained by Mike Love, The Beach Boys play an astoundingly busy schedule of concerts, averaging 150 shows a year that range from sundrenched summer festivals to New Year’s gala celebrations and special events across the globe. In 2016, The Beach Boys celebrated the 50th anniversary of the hit “Good Vibrations,” which is widely considered one of the greatest masterpieces in the history of rock and roll. The band commemorated this prolific time in the life of The Beach Boys with a “50 Years of Good Vibrations” tour. Additionally, front man Mike Love released his highly anticipated memoir, Good Vibrations: My Life as a Beach Boy, the same year. The Beach Boys have continued to create and perform with the same bold imagination and style that marked their explosive debut more than 50 years ago. In 2013, their Sounds of Summer (RIAA certified triple platinum with more than three million in sales and climbing), and its companion, The Warmth of the Sun, marked a resurgence of interest in The Beach Boys that again rocked the world. This remarkable band could have retired with honor at dozens of points along the way, confident that it had made a lasting contribution to the world. They could have rested on the success of the epoch-shifting Pet Sounds masterpiece in 1966; after Mike Love’s concept album Endless Summer ignited a second generation of Beach Boys fans; after Love co-authored the Golden Globe-nominated “Kokomo” in 1988 and it becoming thier best-selling single ever; after being inducted into the Rock & Roll Hall of Fame; after blowing past 100 million in worldwide album sales; or after being awarded a NARAS Lifetime Achievement Award in 2001. And still, The Beach Boys continue to have fun, fun, fun, with no end in sight. They were center-stage at Live Aid, multiple Farm Aids, the Statue of Liberty’s 100th Anniversary Salute, the Super Bowl, and The White House. On one day alone—July 4, 1985— they played to nearly 2 million fans at shows in Philadelphia and Washington, DC. On The Beach Boys’ horizon is a continued national/world tour and charity activities through Mike Love’s Love Foundation, which supports national environmental and educational initiatives. Love and The Beach Boys’ efforts have raised more than a quarter of a million dollars for the Red Cross to benefit victims of Hurricane Katrina, and made additional contributions to disaster relief in Haiti. Singer/songwriter Rhiannon Giddens is co-founder of the Grammy Award-winning string band, the Carolina Chocolate Drops, in which she also plays banjo and fiddle. As a solo artist, her elegant bearing, prodigious voice, and fierce spirit dazzles audiences worldwide with her masterful blend of gospel, jazz, blues, and country delivered with extraordinary emotional range and dazzling vocal prowess. CAPA presents Rhiannon Giddens at the Southern Theatre (21 E. Main St.) on Saturday, May 19, at 8 pm. Tickets are $25-$50 at the CAPA Ticket Center (39 E. State St.), all Ticketmaster outlets, and www.ticketmaster.com. To purchase tickets by phone, please call (614) 469-0939 or (800) 745-3000. Giddens began gaining recognition as a solo artist when she stole the show at the T-Bone Burnett-produced “Another Day, Another Time” concert at New York City’s Town Hall in 2013. She brought the audience to its feet that night, and why is abundantly evident on her critically acclaimed, Grammy-nominated, debut solo album, Tomorrow Is My Turn (2015). Her follow-up album, Freedom Highway, was released in 2017. It includes nine original songs Giddens wrote or co-wrote as well as a traditional song and two civil rights-era songs, “Birmingham Sunday” and the Staple Singers’ well-known “Freedom Highway,” from which the album takes its name. Giddens’ TV performances include “The Late Show,” “Austin City Limits,” “Later…with Jools Holland,” “CBS Saturday Morning,” and “CBS Sunday Morning,” among many others. She performed for President Obama and the First Lady for a White House Tribute to Gospel, televised on PBS. She performed the duet with country superstar Eric Church on his powerful anti-racism song, “Kill a Word,” on “The Tonight Show” and the CMA Awards, among other programs. Giddens received the BBC Radio 2 Folk Award for Singer of the Year, and has won the 2016 Steve Martin Prize for Excellence in Bluegrass and Banjo. PJ MASKS LIVE: Time to Be a Hero is a super-heroic, live musical, featuring the heroic trio from “PJ Masks,” eOne’s top-rated animated TV series which airs daily on Disney Junior. Featuring familiar and brand-new songs, Catboy, Owlette, and Gekko leap, flip, and climb live on stage as they try to save the day from sneaky villains Romeo, Night Ninja, and Luna Girl. CAPA presents PJ MASKS LIVE: Time to Be a Hero at the Palace Theatre (34 W. Broad St.) on Friday, May 11, at 6 pm. Tickets are $30-$50 ($103.50 VIP) at the CAPA Ticket Center (39 E. State St.), all Ticketmaster outlets, and www.ticketmaster.com. To purchase tickets by phone, please call (614) 469-0939 or (800) 745-3000. “PJ Masks,” the hit TV-series now in its second season, follows the thrilling nighttime adventures of three young friends who transform into their dynamic alter egos—Catboy, Owlette, and Gekko—when they put on their pajamas at night and activate their animal amulets. Together, they embark on action-packed capers, solving mysteries and learning valuable lessons along the way. The Jeanne B. McCoy Community Center for the Arts will kick off a weekend-long, 10th anniversary celebration with a Family Fun Day on Saturday, May 5, from 10 am–2 pm. Through support from Fresh Thyme Farmers Market, the Schottenstein Theater will screen Disney’s Moana at 10 am, followed by performances from the talented students of the New Albany-Plain Local School District. On-site children’s activities will begin at 11 am, including inflatables, caricatures, balloon artists, face painting, and the chance to “Touch a Truck” with the Plain Township Fire Department and New Albany Police Department. All Saturday activities, including the film and student performances, are free of charge. On Sunday, May 6, at 3 pm, multi-platinum, five-time Grammy-nominated recording artist Michael Feinstein will perform with the New Albany Symphony Orchestra in a special concert commemorating the McCoy’s 10th anniversary. The Columbus native and internationally celebrated singer, songwriter, pianist, composer, and author has dedicated his more than 30-year career to the preservation and revival of the Great American Songbook. The McCoy Marquee Series presents Michael Feinstein and the New Albany Symphony Orchestra at the McCoy Center for the Arts (100 W. Dublin-Granville Rd., New Albany) on Sunday, May 6, at 3 pm. Tickets are $46.50-$66.50 at the CAPA Ticket Center (39 E. State St.), all Ticketmaster outlets, and www.ticketmaster.com. To purchase tickets by phone, please call (614) 469-0939 or (800) 745-3000. The 10th anniversary celebration concert is made possible through the generous support of the Lbrands Foundation, The Mendoza Company, and The Raines Group. The 2017-18 Marquee Series at the McCoy Center for the Arts is made possible through the generous support of the New Albany Community Foundation, Lbrands Foundation, and 10th anniversary season producers, Savko and Scioto Ready Mix. Concert supporters for the 2017 -18 Marquee Series season include Axium Plastics, EMH&T, Ohio Equities, Ruscilli Construction Co., and Underhill & Hodge.